Pdf Image Extractor tool pulls out all the embedded graphics from Acrobat Pdf. It is the best tool ever found as it provides option to preview and edit extracted images before storing them on local disk drive. Tool supports bulk pdf files. 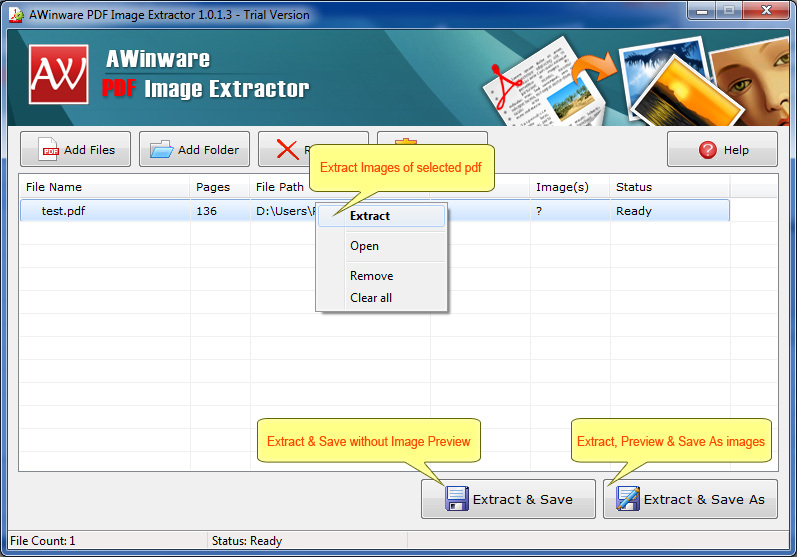 AWinware Pdf Image extraction utility supports exporting of JPEG, BMP and TIFF image formats and lets user to convert these extracted formats into another formats like GIF, PNG, TGA, WMF, EMF and PCX. 1. Tool preview extracted bitmaps before saving on disk. 2. It exports all embedded images file formats. 3. Pdf image extractor software supports all versions of pdf documents. 4. Inbuilt image editing option to flip and rotate images. 5. It is compatible to run on Windows XP, Vista, 7 and Windows 8 OS.